We have a special event across all AE games! 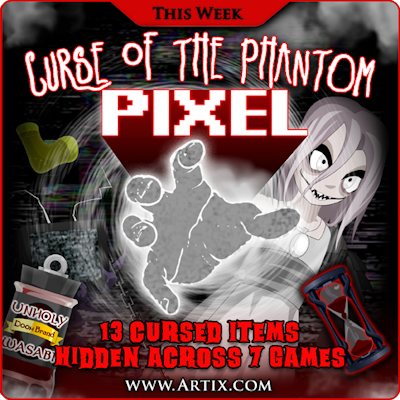 The Curse of the Phantom PIXEL! Hunt down cursed items to unlock the OmniKnight Blade (comes with an in-game shop, badge, and it is click-able with CC energy blade). HeroSmash has placed an Epic Shield on the monsters in the HOTtest zone. Enjoy the hunt! Also we want to wish all Canadians a happy Thanksgiving weekend! Next week, we'll be adding some last-minute items to the Talk Like a Pirate Day Shop, which will be gone the following week, so keep an eye out (unless you have a eye patch on).